I am a big believer that God brings people into your life for a reason. Not everyone is meant to stay forever but some are. And that’s when it gets good. As most of you know, I am a Shreveport transplant and when I arrived on the scene in North Lousiana, I knew no one but Big Daddy, his brother, and his daddy. That’s all. One of the first people I met was Leia. She was about 16 and I was about 19. We met in passing one day and that was it for a while. In fact, the first time I met her as a matter of fact, I was pretty sure she did not like me much. Remember, I was an outsider. Somehow though, as time went on, Leia took me under wing and made me her friend and the rest as they say is history. Well, not really…a couple of things have occurred between now and then. Couple of weddings (I was in her’s, she was in mine), some graduations, jobs, couple of babies, life…we have stuck together through it all. I lived with Leia, who I call Ned and she calls me Ned (don’t ask) one summer and we loved to cook in the tiny little kitchen of her first house. Big Daddy was working out town that summer, and at the time I missed him terribly, but looking back, I am so glad to have had that time with her. She was expecting her first baby at the time and that baby is now a college student. That tells you how far back we go. If there is anyone on this a Earth I don’t ever question, it is Leia. She is always in my corner and I am pretty sure she knows I have her back no matter what she is up against. She is a tough cookie and I am just glad to have her on my team. I would not want her as an enemy. She is part sweet southern belle mixed with fierce badass and it equals one amazing friend. Sister knows how to take care of business. Need someone to plan one heck of bachelorette party? She’s your girl. There’s no end to the power of Ned and those who are lucky enough to have her in their lives would do well to remember that. There is no end to the power of Ned. Me and Ned, circa 2001, at my bachelorette party . 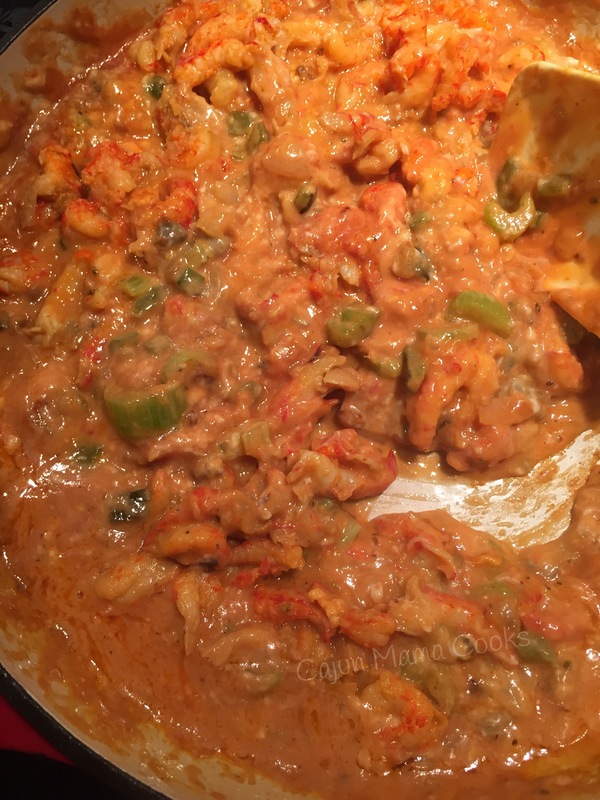 Now this crawfish pie recipe…it’s pretty special. And delicious. I had never had crawfish pie before I tried this one, so of course, it was love at first bite. Even though it is a Cajun delicacy, the recipe could not be easier to prepare. As I made it the other night, I giggled to myself how much I have learned in the kitchen since those days. I was probably 20 at the time, and I had no idea about white pepper or if there was a difference between white and black pepper. Nor did I bother looking for white pepper at the store. I probably thought it was a typo. Now, of course lessons have been learned in and out and the kitchen and I have a jar of white pepper in my seasonings cabinet. Ned and I have learned some other lessons as well. Lessons like…life can be hard, but it’s a lot easier when you have a good friend always there. And that some people are always loyal, even if you don’t talk to them everyday. Some friendships begin and don’t ever end. Thank God. Love you Ned, thanks for the crawfish pie recipe and for all the love and loyalty. Preheat oven to 350 degrees. 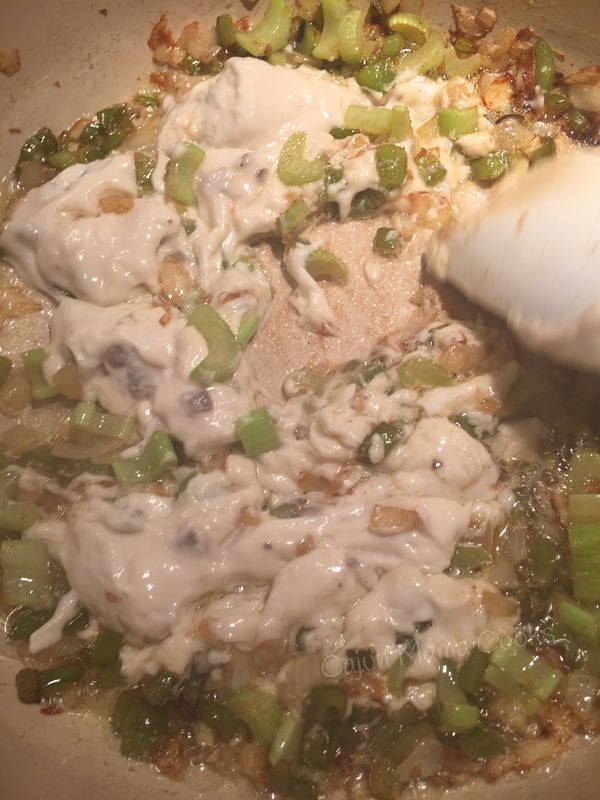 Melt butter in a large skillet or sauté pan. 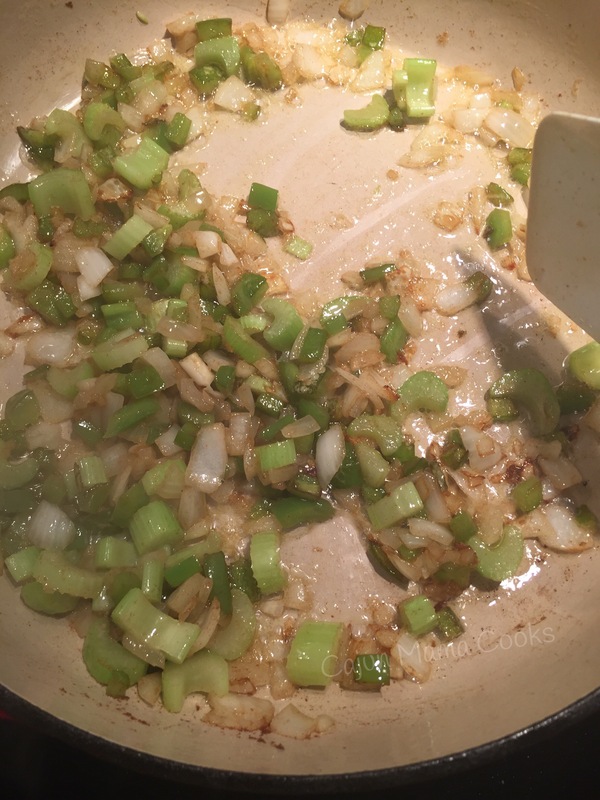 Sauté onions, bell peppers, and celery in melted butter until they are tender. At some point before the veggies are tender, sprinkle in the salt, pepper, red pepper, white pepper and thyme. 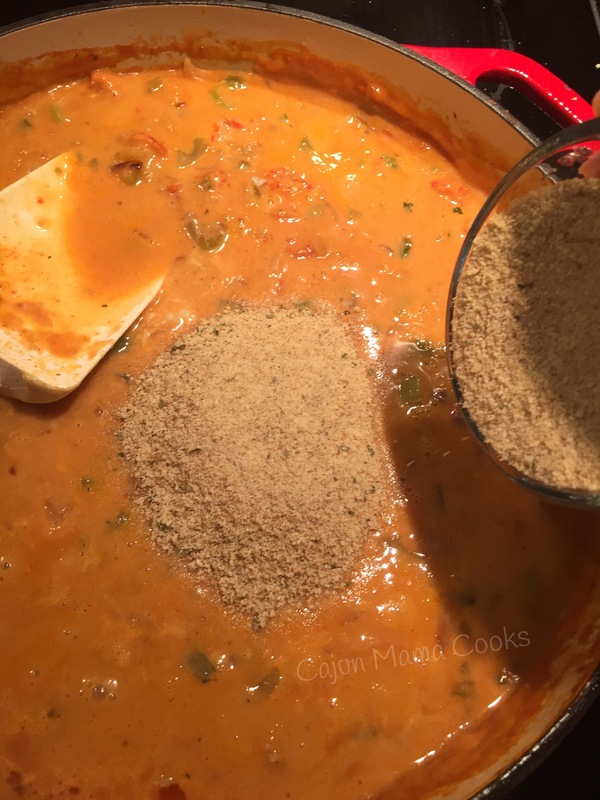 This way the seasonings can get in there and really make their mark and have plenty of time to infuse the filling with their delightful spiciness. Yes I wrote that…delightful spiciness. Next stir in your cream of mushroom soup. Next, stir in the crawfish tails and white wine. All together…mmmm. Just. So. Delicious. Add the milk, beaten egg* and the breadcrumbs. Either make your own in a food processor with some white bread or use plain breadcrumbs. I only had garlic and herb breadcrumbs this time and I found it threw the flavor off. Still good but not as good as I remembered. So next time, plain breadcrumbs it is. Stir them in and let the mixture simmer over low heat. 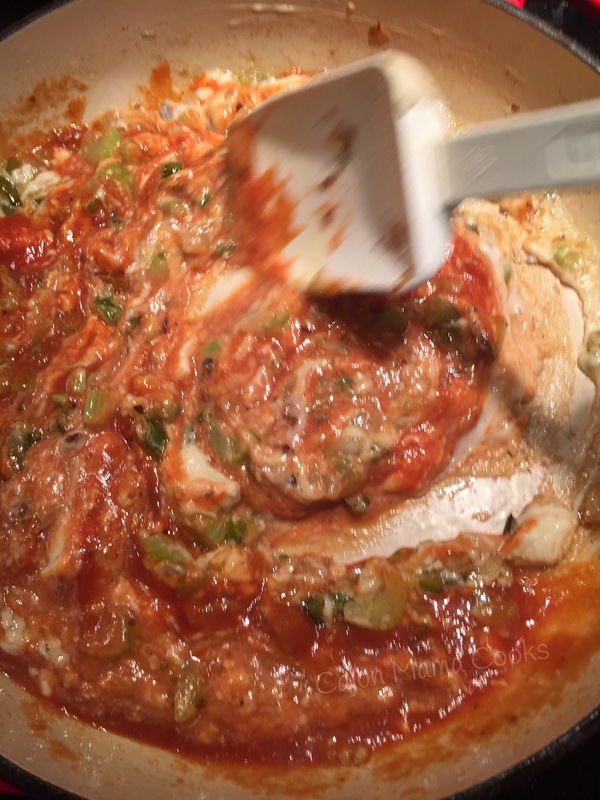 Stir the mixture frequently as it is simmers. Now, take one of the pie crusts and lay it in the bottom of your pie plate. Prick it a few times with a fork and pop that baby in the oven for a few minutes. You just want to slightly brown the bottom pie crust. Now, feel free to be a real show off and make your own pie crusts. If that is your fortay, rock on with your bad self. As for me and my house, we will use store bought pie crusts. I own it. If someone wants to offer to come give Cajun mama a pie crusts baking lesson, let me know. As I have mentioned before, I am baking challenged. I can do it, but homemade pie crusts are not something I aspire to. Finally, pull that prebaked bottom pie crust from the oven. Now pour that savory filling into the pie plate until it is piled high. Yum!!! 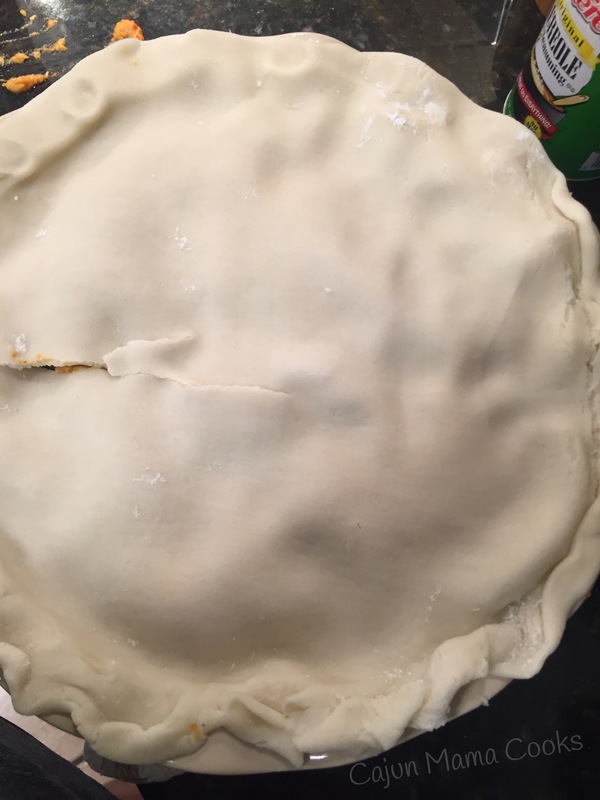 Cover the filling with your second pie crust and pinch to sort of seal it around the pie plate. Yes! Crawfish pie! You made that! Work it! Hold on now, you got to put it back in the oven to brown your top crust. Here is my crawfish pie before I popped it in the oven. You are all set!!! Hope you enjoy this truly unique and tasty dish!! 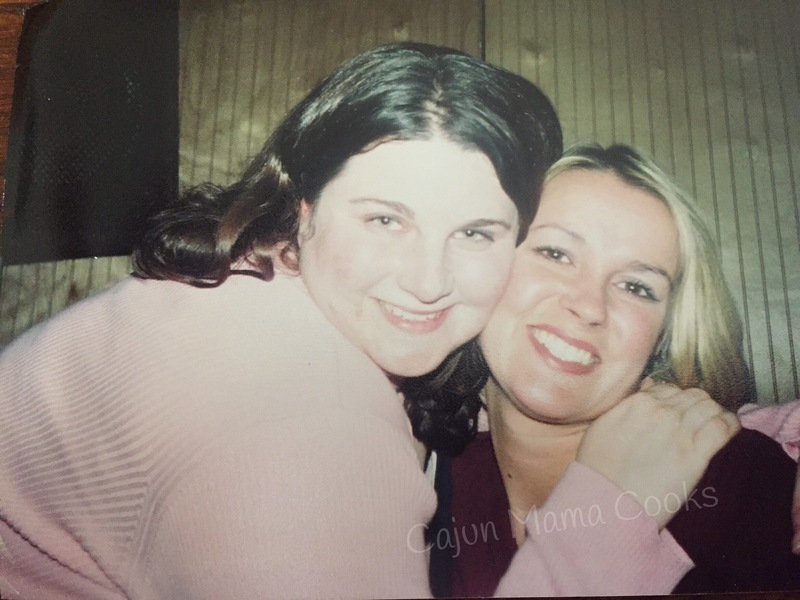 Aimee, what an inspiration story of friendship and food over a lifetime. This is such a well written account of your journey and my mouth is once again watering with anticipation of cooking this when I get back home. The Richards are a house divided. In the shrimp vs crawfish debate and Nigel and I are team crawfish but Finnly is exclusively team shrimp with Marc. Amber recently told me she now likes seafood which goes to show you that tastes do evolve. Heather’s nickname is “Frimp” over an episode we will just call – the Great Shrimp Standoff of 2003. Too many new things coming at you all at once can shut a girl down and she was having none of that! BUT…. I think everyone can go for this delicious recipe because after all- who can not love pie? As a visual person and fan of your blog – it is so helpful for me to see step by step in photos- so thanks for that. Guess what? I AM a fabulous baker! I own that. And Aimee, I BUY my pie crust! I admit it:) I have rolled out homemade crust many a time but honestly Ginger Evans brand cannot be beat! Why fight with a rolling pin when you can grab this box and be on to the next thing. I do find it therapeutic to rub flour on my pampered chef rolling mat. It brings fond memories of baking with my mama and using her plastic tupperware mat with all the graduated circles. So give yourself a break and know that if it is prepared at home with love= then is is homemade! I love you! This is my first morning away from my kiddos and sure- I should be sleeping in, binge watching netflix uninterrupted or even reading peacefully by the pool. Instead, I am up planning meals for when we are at home again cooking together. So thanks for introducing us to Leia and crawfish pie! I have never heard of ginger Evans. I need to check it out!!! Where can I find those? I cannot wait to eat some of your baking!! And cooking. Lol. Love you. and lol at great shrimp standoff!